Bamboo Hanging Bridge in Loboc, which crosses the Loboc River is a popular attraction visited by tourists. Local tourists and foreigners alike find it worthy to experience crossing it. Why Bamboo Hanging Bridge is special ? 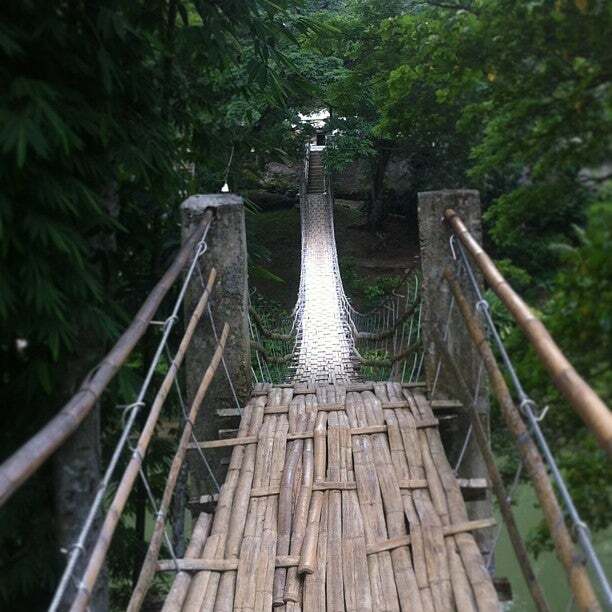 The Bamboo Hanging Bridge is found in the upper area of Loboc River in Bohol. The Hanging Bridge is a foot bridge composed of bamboos and hardened steels which was initially used by locals to cross the river going to the Barangay on the other side of the main road. The Hanging Bridge hangs about 25 meters above the river. Originally constructed using just bamboo and rope, today the rope has made way to steel cables, giving added safety and stability. The deck of the bridge is formed out of woven bamboo slats. In places some of these appear broken but its still sturdy enough to take the weight of tourists, locals and even small motorcycles. The Hanging Bridge may not be a very good tourist spot as it is just ordinary for Boholanos but local tourists and foreigners alike find it worthy to experience crossing it. What to explore at Bamboo Hanging Bridge? Walking onto the bridge is a little daunting at first as the bamboo deck flexes a little under your feet. Although the support cables are now made of steel, you still experience some side to side sway and up and down bounce. The safety and security of the Hanging Bridge was compromised because more and more people go together all at once which made the government decide to add another bridge to be used as exit, while the old one as entrance. 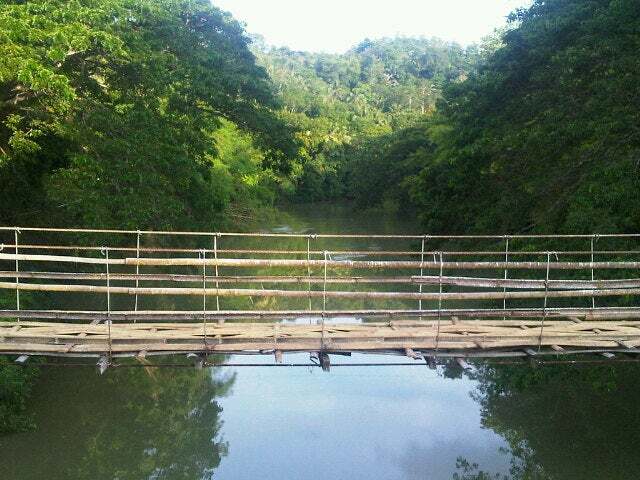 The bridge spans around 40 meters and offers a great view of the emerald Loboc river below. Bamboos, Coconuts, Mangroves and other kinds of big trees are visible in the area. On the Barangay side, locals are selling souvenir items such as ukulele, hats, fans, bags, shirts and many others. How to get to Bamboo Hanging Bridge? One can find the Bamboo Hanging Bridge along Loboc River in Loboc and Sevilla. Taxi and tricycle can take you there. The entrance fee is P10.00 for those who don’t live in the Barangay on the other side. The bamboo flooring also gets very slippery expecially during or after the rain so you should really watch your steps. The bridge sways back anf forth as you walk on it so you'd surely hold on the railings whether you like it or not. On the far side of the bridge you will find “The Buko King”. He can strip a coconut (buko) in something like 10 seconds using just his teeth. The load limit of the footbridge is only 10 persons to pass at a time. They will prohibit any person to pass the Hanging Bridge if beyond the load limit. An interesting tourist spot, the bridge is simply that. You walk across it, and walk across another to get back. On the other side are souvenirs and refreshments. Nothing more can be said, it's not a bad location, but it is more of a stop or a place that makes up a small piece to a larger puzzle. See it if you can along your trip.